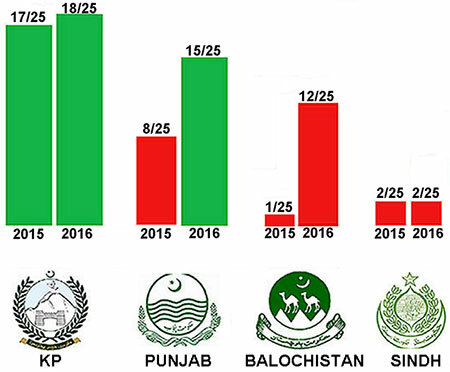 October 25; Public Approval Ratings for the Federal Government, though has shown improvement from 2015, remains negative on most governance indicators as per PILDAT’s Public Opinion Poll on the Quality of Governance and Democracy during the third year of the Currently Elected Federal and Provincial Governments, June 2015-May 2016. 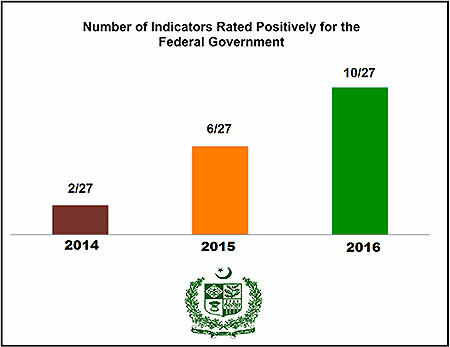 The Federal Government has received positive Approval Ratings on 10 out of 27 Governance indicators compared to 2015 Public Opinion Poll by PILDAT in which respondents rated positively 6 out of 25 indicators. These public views are part of a PILDAT Nationwide Public Opinion Poll on the Quality of Governance and Democracy in Pakistan upon the completion of the third year of the current Federal and Provincial Governments. This poll was conducted between August 11-August 31, 2016 and included 3,610 Pakistani citizens from rural and urban areas and 85 districts across Pakistan. The Federal Government received its highest Approval Rating for the Governance indicator on Immunization of Children (77%). At the lowest rung was Management of Unemployment for which Federal Government received the lowest Approval Rating at 31%. 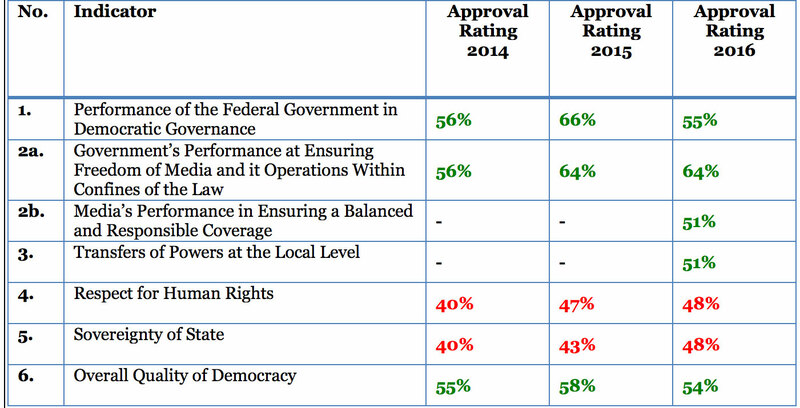 The Approval Rating of the Federal Government has crossed the 50% mark and became positive on 4 Governance indicators since 2015 namely: Development Programmes with approval rating of 54% in 2016 compared to 44% in 2015; Use of Technologies for Better Governance rated positively by 54% respondents in 2016 compared to 48% in 2015; Foreign Policy Management with 54% approval rating in 2016 compared to 44% in 2015 and Tax Collection which received 53% approval rating in 2016 compared to 38% in 2015. Legend: Green colour depicts Approval Rating for the Indicator is more than 50% while Red colour indicates Approval Rating for the indicator is less than 50%. 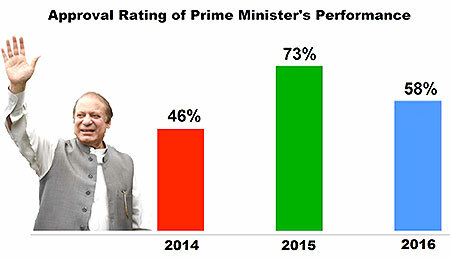 58% of the nationwide respondents have termed Prime Minister’s performance positively in 2016 while 41% have rated it negatively. This has seen a sharp decline of 15 percentage points from 73% approval rating in 2015. Governance in Punjab is rated the highest among the four provinces across nationwide respondents with 67% approval rating. Governance in KP has received second position with 38% nationwide respondents rating it positively. Governance in Balochistan has been rated positively by 26% respondents while governance of Sindh is rated the lowest nationwide with 25% approval rating (Table 2). 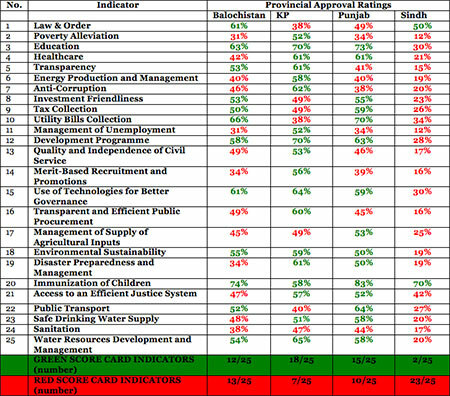 When respondents were asked to evaluate performance of their own province on individual Governance indicators, Khyber Pakhtunkhwa received the most positive Approval Ratings for 18 out of 25 indicators (in 2015 the KP residents had rated 17 out of 25 indicators positively). 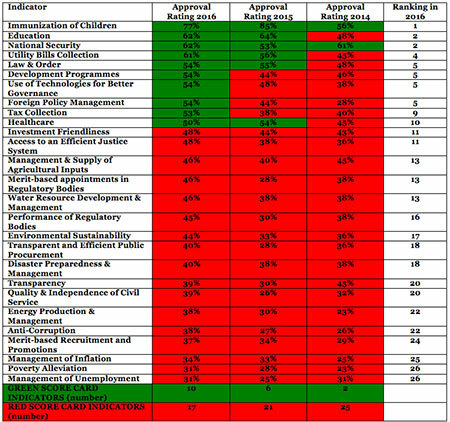 KP is followed by Punjab where Punjab residents have positively rated 15 out of 25 indicators (in 2015 the residents had rated 8 out of 25 indicators positively). Balochistan has bagged the third position with Balochistan respondents positively rating 12 out of 25 indicators. Governance in Balochistan has received the highest improvements in public opinion in the past one year as the respondents from Balochistan had only rated 1 out 25 indicators positively in 2015. For the second consecutive year, Sindh once again is at the bottom where Sindh respondents have only rated 2 indicators out of 25 positively. The highest Approval Rating for any provincial Governance indicator was accorded to the Punjab for Immunization of Children at 83%. The lowest Approval Ratings of 12% were accorded to Sindh on the Governance indicators of Poverty Alleviation and Management of Unemployment. 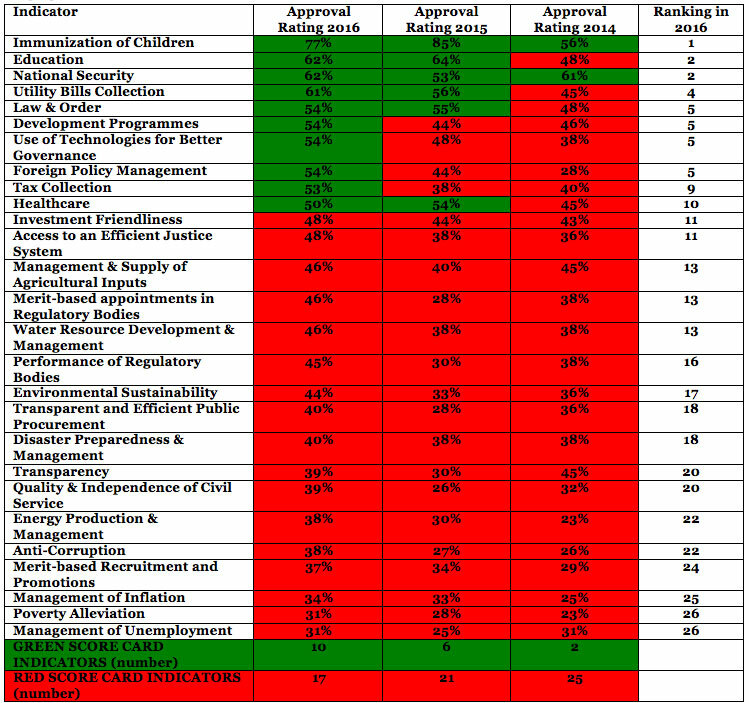 Table 2: How did nationwide respondents rate governance in provinces? 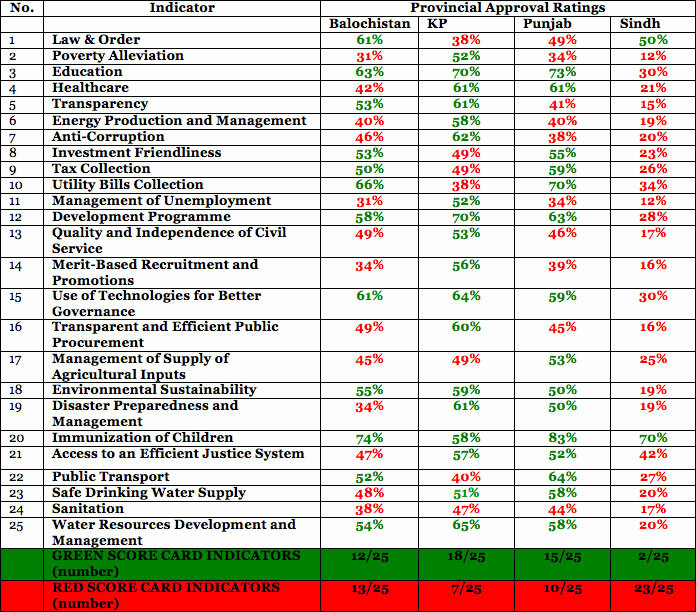 Table 3 shows a comparison between province-wise Approval Ratings accorded for each individual Governance indicator in 2016 from the residents of each province. While majority of the respondents (54%) nationwide remained confident and positive about the quality of democracy in Pakistan in 2016, this has seen a decline by 4 percentage points from 2015 when 58% respondents rated it positively. It is interesting to note that there is a divergence of 13 percentage points between Government’s performance at ensuring freedom of the media, and the media’s performance in ensuring balanced and responsible coverage. 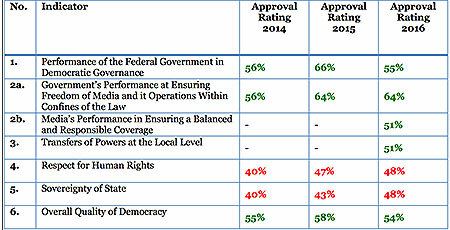 A public Approval Rating of 64%, the highest amongst all Core Democracy Indicators, shows that the although respondents are highly satisfied by the Government’s performance in ensuring media’s freedom, their perception of a balanced and responsible coverage in turn by the media itself hangs in balance (an Approval Rating of 51%) and can swing either way. The overall picture points to a continued trust in democracy but one that is nuanced and qualified. It is pertinent to point out the Public Perception is neither highly Satisfied nor Dissatisfied on any of the Indicators as the highest Approval Rating goes up to 64% and the lowest goes down to 47%, pointing to a very large proportion of Respondents who are sitting on the fence and may change their opinion based on the next 2 years of the current democratic and electoral cycle. The Election Commission of Pakistan continues to suffer from negative public perception as only 35% of nationwide respondents are hopeful of an improved performance by the ECP in the next General Election. This has seen a 3 percentage point decline since 2015 when 38% believed the ECP would improve its performance in conducting future General Election. 28% Respondents have serious doubts about the Election Commission and believe that the ECP’s performance will fare worse in the next elections. 32% of all respondents believe that the ECP’s performance at holding free and fair elections in the country will be no different from holding earlier elections. The biggest current issue seen to be facing Pakistan in 2016 was Terrorism by 23% of all respondents. In 2015 Public Opinion Poll, the greatest issue was termed to be Energy Crises by 25% of all respondents. Inflation and Unemployment had been seen as amongst the greatest issues in 2015 and continue to be seen that way in 2016. 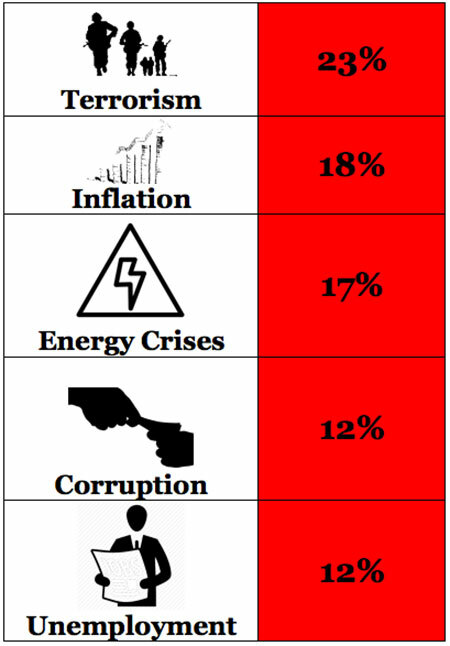 It is noteworthy that Corruption has made its way into the top five issues facing Pakistan as 12% of all respondents term it as the biggest problem in the country.